Chicago Wilderness is a multi-state alliance of more than 300 organizations dedicated to restoring biodiversity in a large metropolitan region that stretches over 1.9 million acres in three states. Home to 10 million people today, it is also the homeland of Algonquin speaking people who were sustained by a mixed landscape of prairies, woods, wetlands, and Lake Michigan and associated waterways. While the area includes 545,000 acres of protected lands and waters, today it is one of the most developed areas between the two coasts. Chicago and its greater metropolitan region play an important part in the conservation of our nation’s biodiversity. Like most cities, it was founded in a place that was rich in natural resources and provided valuable ecological functions, such as on floodplains, shorelines, or wetlands. Today, as urbanization continues to expand into these valuable habitats and beyond and it is critical to learn how to protect, restore, and connect the regions natural resources to maintain the ecological functioning of natural systems that benefit both people and wildlife. 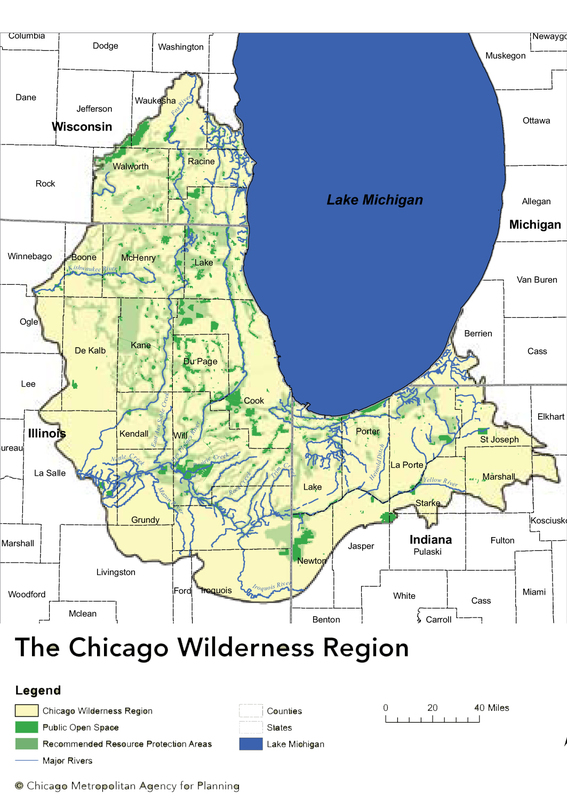 As an organization Chicago Wilderness has had nearly 20 years of experience developing collaborative partnerships and science-driven plans and actions for regional biodiversity recovery and conservation. Some of the initiatives include the preparation of a Green Infrastructure Vision to help guide regional landscape scale work on a variety of interrelated efforts such as: habitat restoration, habitat-specific climate adaptation strategies, climate-informed green infrastructure mapping for municipalities, and engaging non-traditional conservation partners. To meet goal of more protected habitat, the organization took the lead on establishing a new National Wildlife Refuge the Hackmatack National Wildlife Refuge. Established in 2012, the new refuge employs a Cores and Corridors concept for wildlife preservation with a focus on migratory and grassland birds. Four core areas will be protected alongside existing conservation lands held by other partners by local and state government partners. Tributaries of Nippersink Creek will serve as wildlife corridors to connect most of the core areas. It is hoped that these corridors can be protected through work with local landowners. The corridors will assist terrestrial migration of small mammals, herptiles, and plants that may be impacted by a changing climate. Chicago Wilderness also reaches out to the people who live in the resource with the goal of building community stewardship. It runs programs to promote the region’s outdoor recreation opportunities and encourages the exploration of close by nature. It encourages residents to green their properties with rain barrels and by planting with native species. The imaginative No Child Left Inside program helps reconnect school age children with nature. In a rapidly urbanizing world, the Chicago Wilderness alliance pioneered a model for how organizations can work together, across a complex metropolitan regions to achieve greater conservation impact than any one organization can by working alone. As a national leader in urban conservation, Chicago Wilderness now leads a coalition known as, the Metropolitan Greenspaces Alliance. To date this national network includes seven U.S. metropolitan regions, which together are home to more than 30 million people. The alliance is working to promote the collaborative approach and to share knowledge and best practices across major metropolitan areas.